Frequent Flier Miles - More than 80 percent of wishes require travel. Donate your airline miles to help wishes take flight. Connect and engage with Make-A-Wish Oregon on social media. Whether it’s to share our mission with others or to be inspired by our wish kids, it’s a great way to stay up to date. Make-A-Wish® Oregon wrapped up the 2015 fiscal year by granting 211 wishes. It’s the most wishes the chapter has granted in one year, and we couldn’t have done it without the support of volunteers, donors, medical professionals and advocates. Some unique wishes that you helped grant included Tristan’s wish for a working rail road crossing arm, Benny’s wish to go to a dude ranch and Lizz’s wish to be a research scientist at the Monterey Bay Aquarium Research Institute. To celebrate the record-breaking milestone and a year of collaboration, the staff spent an afternoon showcasing the power of teamwork by dragon boating on the Willamette River. Thank you to everyone who supported Make-A-Wish Oregon throughout the year. 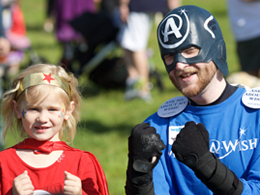 When Evan isn’t dressing up as a super hero at Make-A-Wish Oregon events, he’s volunteering as a wish granter. Like other volunteers, he’s dedicated, giving and selfless. Unlike most volunteers, however, he has a unique perspective because he received a wish from the chapter when he was 16 years old. Read more about what he's learned from both sides of the wish process and why he thinks a wish is like a Venn diagram. You’re invited to an unforgettable evening of inspiration and celebration at this year’s Wish Ball. The formal gala takes place Saturday, November 14, 2015, at the Portland Art Museum. Enjoy music, hors d’oeuvres and dancing while supporting local wishes. You’ll also have the chance to meet some of the children whose wishes you helped make come true. A ticket costs just $75. Buy yours today and help make a difference in a child’s life. A special thanks to our presenting sponsors U.S. Bank and Paulson Coletti Trial Attorneys, our gold sponsors Alaska Airlines and Pacific Seafood, and our silver sponsor Callisto Integration. We have exciting news to share. After eight years in Salem, the Walk For Wishes event moves to Portland’s Washington Park/Oregon Zoo next year. The family-friendly walk will be bigger and better. Mark your calendar for April 16, 2016, and stay tuned for more information about this fun event. © 2015 Make-A-Wish Foundation® of America. Make-A-Wish Foundation, Make-A-Wish, Adopt-A-Wish, Walk for Wishes and the Make-A-Wish swirl-and-star logo are marks of the Make-A-Wish Foundation of America. All other marks are the property of their respective owners.